In the world of Virgin Atlantic what most would label “First Class” is called in a particularly British way “Upper Class”. The question under discussion here is whether or not it is worth it for long-haul travel. After a crowded and cramped coach flight from Sacramento, California to Chicago, Illinois, followed by a rat-maze through O’Hare, I was ready to relax. Enter the lounge experience. Although Virgin does not have a lounge of its own at O’Hare, one is kept happy at the Air France lounge. Complimentary food and beverages as well as comfortable chairs are enjoyable, away from the noisy concourse. On boarding the plane, I found I was the first of the first-class and after finding my seat/bed I went forward and was invited into the cockpit. That just doesn’t happen everyday. A good start, I thought to myself. 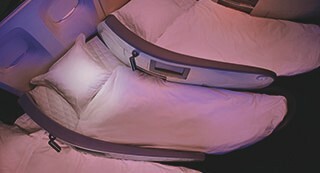 The seats on Virgin and some other airlines convert into almost real beds. I don’t mean just recline; they fold over and become a flat bed with pillow and duvet. I slept for several hours of the eight hour trip. Traveler’s note : one thing I will do next time is use the provided earplugs, since even up front the noise of the plane can be disturbing. The lounge at O’Hare cannot compare to the Virgin Atlantic Clubhouse at Heathrow. It is simply beyond words. I enclose here some shots of the facility from the V.A. website. For one thing, and I believe that it may be unique to Virgin, is that one is made to feel welcome by a really polite and informed staff. There is a full bar and food service. And showers! Yes, even showers if you need to freshen up. Massages are also available. Whew! Check the link above. The flight to Mumbai from London was also excellent but I found that I was asleep from the moment we were airborne until somewhere north of Baghdad. It was interesting to note that due to the current regional conflict, the route diverges northward into Turkey for more than it normally would so that at no point are you flying over Syria or Iraq. I arrived at Mumbai’s new international terminal, completed only a few months ago, just after midnight on the third day of travel, but that is a tale for another time. To answer the question, “is it worth it?” Heck yes, and I would go as far as to say if you can wangle any flight that will let you visit the Virgin Clubhouse at Heathrow, then that alone is worth it. My overall experience with Virgin Air so far is Two Thumbs Up. I purchased discount tickets online so it wasn’t nearly as expensive as it might have been. But beware and check the reviews for some of these discount vendors though. In the end it cost me only about twice of a full fare coach ticket. There is also a Virgin Atlantic category called Economy Plus which should be fine a a short trip that is not overnight. Not just extra legroom but real, wide, reclining seats that are comfortable. Save travels everyone – the Indian journey continues. This entry was posted in Airline, India, Mumbai, Virgin Atlantic. Bookmark the permalink. 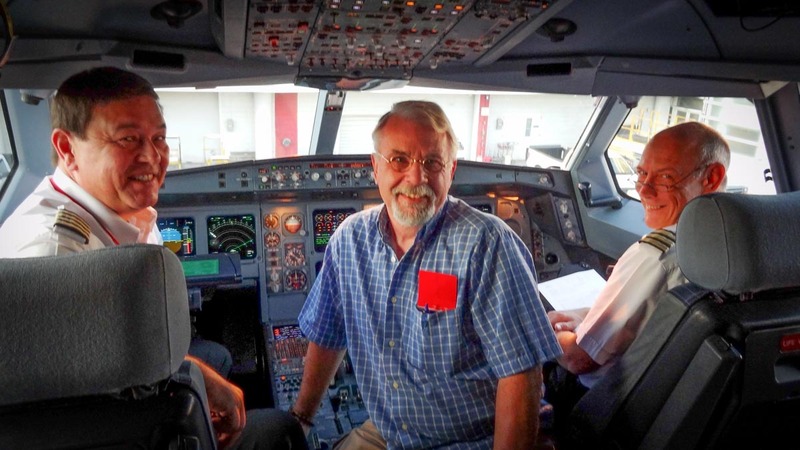 An invitation into the cockpit of a commercial airliner is rare treat these days. Congratulations! Meanwhile, avoiding Syrian and Iraqi airspace is probably not a bad idea. You silver tongued devil you !